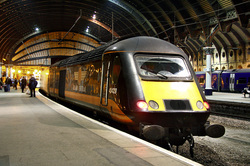 Grand Central operate the fleet of HST-Power-Cars that were fitted with buffers as an emergency stop-gap DVT's way back in 1987 as the new build DVT's were not ready in time for the Class-91introduction on the ECML.Hence they became unwanted until Grand-Central leased them because they were the only ones available.Soon they will be available again as GC intend to replace them completely with cascaded additional 180's from the GWR when available in a year or so's time.A pity because they certainly are very distinctive and full of character (In my opinion). 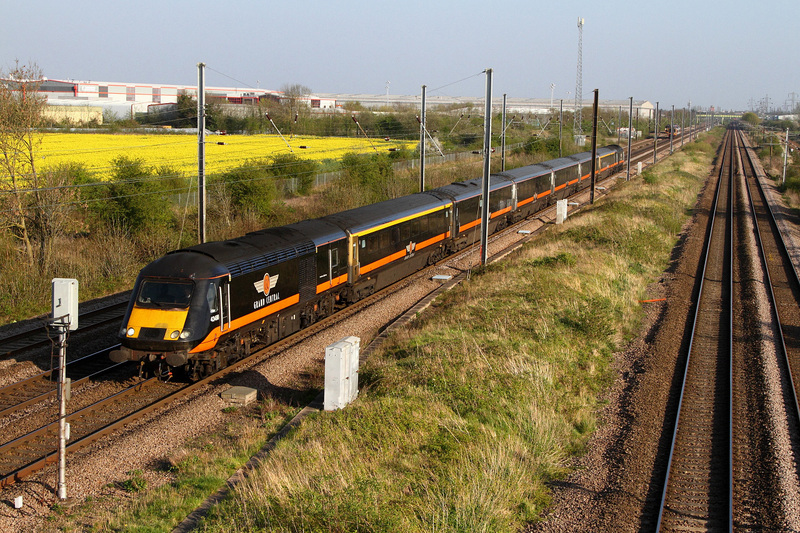 from the 'Cross' going to Sunderland as '1N94'.Note these GC-HST's are short-formed with just 6 coaches and they have 1st-Class at both ends as well! 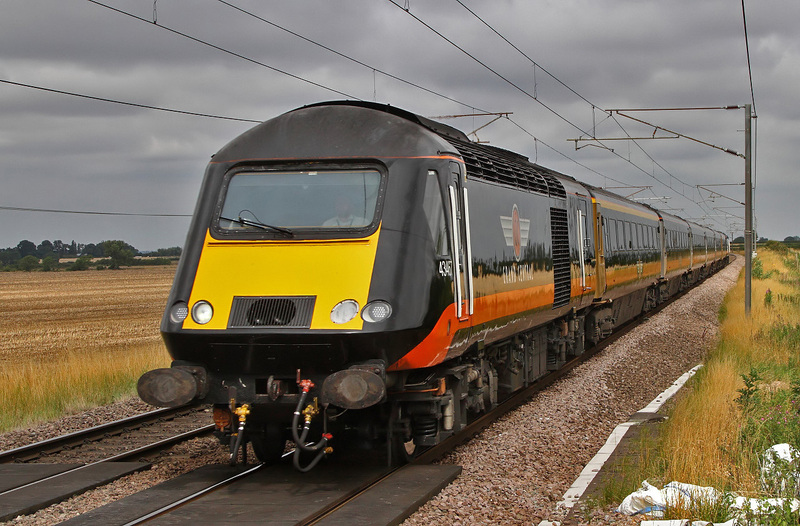 This 'in your face' type shot of 43467 which is partnered with 43423 gives a nice close look at the revised front-end of these buffer fitted Power-Cars used by Grand-Central.According to recent information these HST's (3-sets) are to be replaced here on the ECML by Class-180's cascaded from the GWR.This my not happen as predicted by the end of 2017 due to the obscene shambles that is that electrification scheme.--We will see? 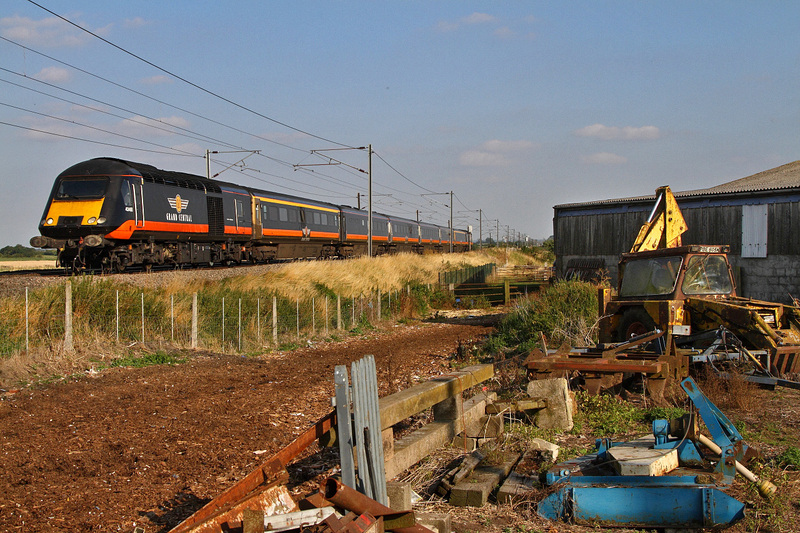 Anyway this working is '1A61' the 08:42 from Sunderland to Kings Cross pictured passing Frinkley Lane. Grand Central's HST-fleet were considered unwanted a few years ago simply because they were the 'buffer fitted' versions.Today they continue to do sterling service on the ECML having all been converted to the MTU type of replacement power-units.This ios 43480 and 43423 speeding northwards past Werrington-Junction at marholm with '1N94' the 16:47 from Kings Cross going to Sunderland. 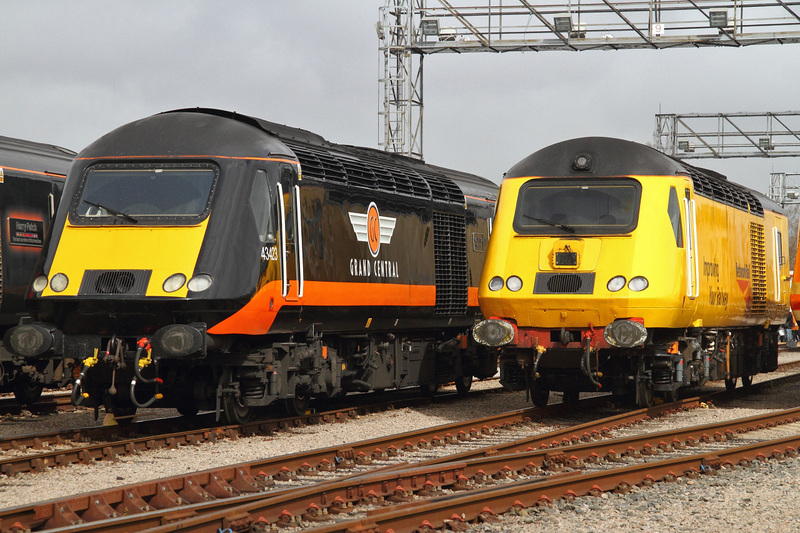 NR's 43013 stands next to 43423 'VALENTA 1972-2010' which is operated by 'Grand Central' out of Kings-Cross to the North-East.This company picked up all the unwanted 'buffer-fitted ' ex-DVT versions and gave them a new lease of life,even fitting MTU-engines.For my money I think these distinctive Black/Orange versions are something quite special.I reallymust get over to the ECML and picture them more often! 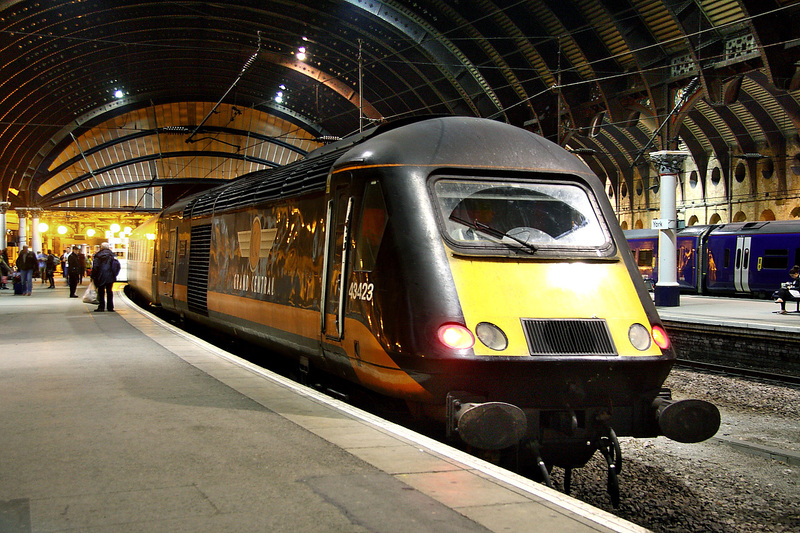 Grand Central's service '1A69', the 17:31 from Sunderland going to London-Kings-Cross is seconds away from departure giving me barely enough time to picture the rear power-car 43423 let alone trying to get to the front end! 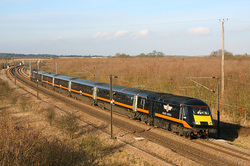 This Company is notable in that its fleet of Class-43 powercars are the buffer fitted variety that nobody else wanted a few years ago.They are of coarse now all fully updated with the latest MTU engines and control gear.Not only that but that Companys distinctive livery adds a bit of variety to the scene as well. 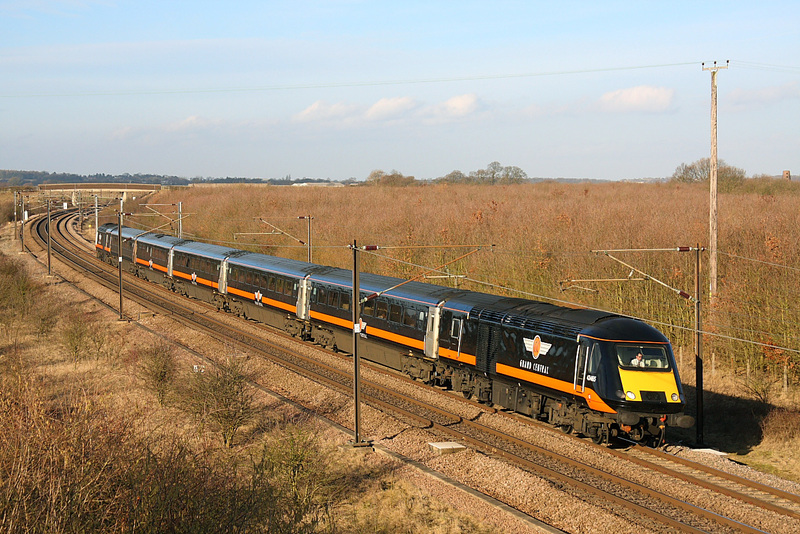 Stylish HST run by Grand Central runs down past Bolton Percy on the ECML with '1A62',the 12:30 from Sunderland going to Kings Cross. 43185 was leading. At this time the 'Grand Central' were still 'valenta' powered.All the P/C's being the buffer fitted example that were until recently largely unwanted. 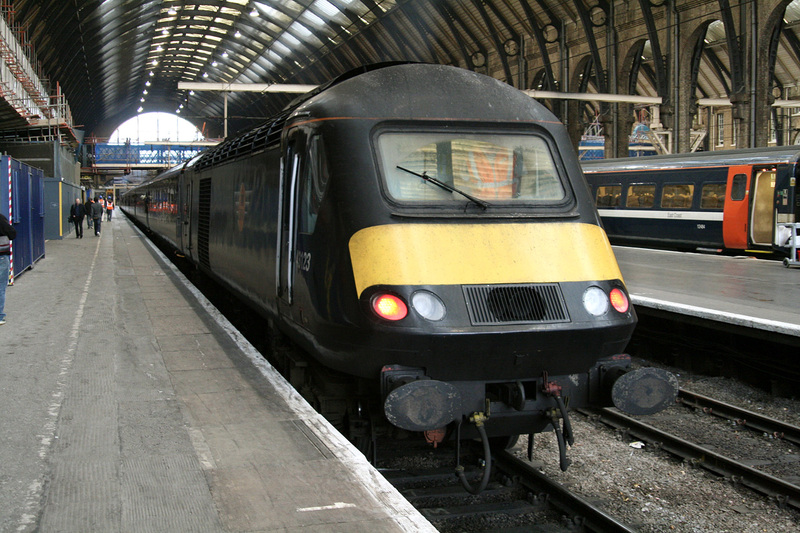 The franchise was less than a year old when this shot in Kings-Cross was taken of 43123 standing at the rear of a service due to go to Sunderland.Also this set had not yet been adorned with the trademark train length Orange Stripe of that Company.